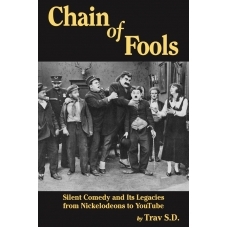 What, I ask you, could be more vaudevillian than a banjo-playing Harry Langdon impersonator? Answer: nothing! 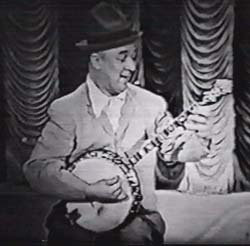 Born this day in 1908, Gene Sheldon’s act was that he would come out and convince the audience that he was scared and incompetent…and then wow them with his banjo playing prowess. Born Eugene Hume, he began his performing career as an assistant to his magician father. In addition to his time in vaudeville, he appeared in nightclubs, Broadway revues, extensive television (especially for Walt Disney) and several Hollywood films. He died in 1982. Next What Was “Black Vaudeville”? My grandmother, Linda Preston, sang operatically while he pantomimed sewing his fingers together! 🙂 Nice to find your post. I linked to it from my post about my grandmother’s touring with him. Thanks! wow! what an act! Hirschfeld told me that Sheldon’s big piece of business was sewing his fingers together. This is the best comment that has ever found it’s way to my comment page — it’s actually better than the post! Thanks, David! The image of Perelman decking a performer will put a spring in my step all day! You are too kind. Your post showed me Sheldon’s act after years of only hearing about it.